After a break of 3 years PT has been brought back to life again! At first - thanks a lot to all server and mirror sponsors! The United Defense Forces are fighting against a new generation of cyborgs, called the Hammer of Retribution. 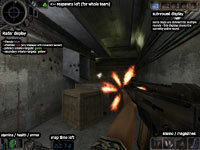 PT offers an individual gameplay by using a campaign system that allows maps to be split up into different missions with individual mission-targets. You can choose between many different weapons (realistic and futuristic) and special equipment like a stealth generator or a movement-sensor. PT tries to unite fast paced gameplay with complex tactical depth. For more information please browse this site. Finally - we hope you like the new release and you'll give it a try! to offer these public servers for the release! The new version is more easy to handle for people that are new to PT. It's faster and the overall playability has been improved. The experience of gameplay in PT is something special and it's something different. It's fast, it's tactical, it's fun. [+] the campaign system offers mappers large possibilities in creating and designing their maps. The choice and combination of mission-targets is hardly restricted. You can implement a very huge variety of gameplay styles. The installer-version should be self-explaining. The timeless folder has to be within your Half-Life folder. where your@email.org is the email adress you are using for your Steam account. If that folder doesn't exist, once start a game of "Half-Life". Afterwards the folders should be there and you can extract the files. © 2000-2007 Project Timeless : html/design by Johannes Ewald and Moritz Cohrs. All Rights Reserved.